The monthly ArtSmart Roundtable brings together some of the best art-focused travel blogs to post on a common theme. This month we are focusing on Art Experiences. Check out all the inspiring and fantastic stories below! I’ve joked before about my “art pilgrimages” but I truly think some works need to be seen in person. There are details that can not be conveyed in photographs, and sometimes the scope and effect of the piece can only be appreciated in front of the artwork. I’ve experienced this sense of presence most intensely with the 12th century Bayeux Tapestry. Essentially a 230 foot long storyboard of exquisite embroidery, this object retells the the Battle of Hastings with drama, charm, and emotion. Without even realizing it, I spent 4 hours with the Bayeux Tapestry and loved it! 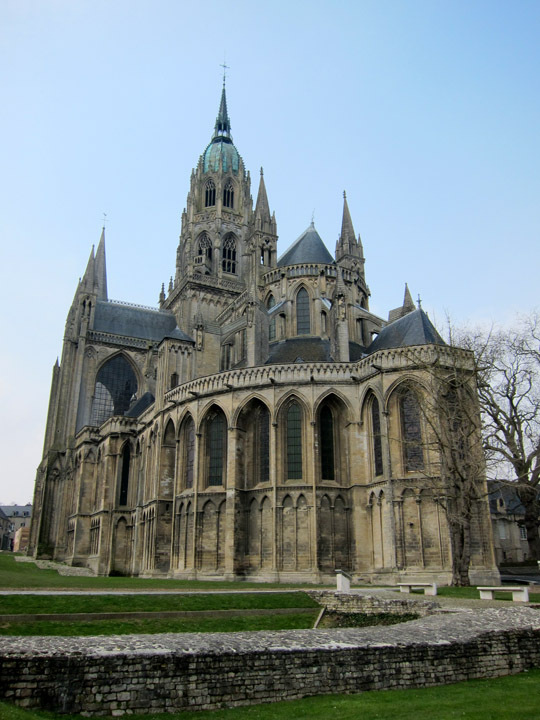 Bayeux Cathedral – The Tapestry may have been created for the consecration of this church in 1077 CE. The Battle of Hastings in 1066 was the decisive conflict between William the Conqueror who had invaded Britain from Normandy and Harold the current King of England. As you can tell from his later moniker, William won the battle. 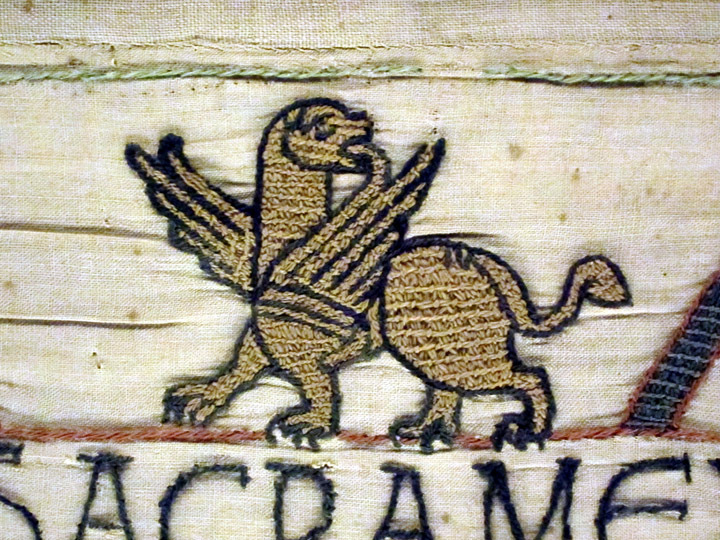 As the story goes, Bishop Odo, who had helped William, commissioned an elaborate embroidery to commemorate the victory for his home cathedral in Bayeux, Normandy. While legend has it that William’s wife Queen Matilda produced the piece, recent scholarship has suggested that the decoration was actually done in conquered England. The Bayeux Tapestry as it is displayed today. Today the Tapestry is hung in a dedicated gallery one long “U” allowing visitors to walk along the story. The light is very low to preserve the brilliant red, blue and green dyes. The low, yellow light on the tapestry reminded me of viewing it by candlelight. While there are excellent interpretive exhibits in the museum about the construction, time period, and interpretation of the Tapestry, visitors are given unlimited time with the piece which is essential for appreciating its wonderful detail and hidden meanings. 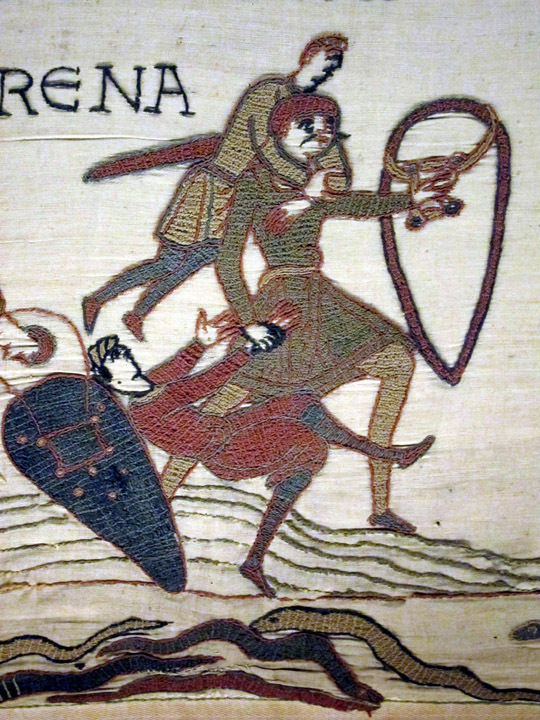 While prisoner in Normandy, Harold (shown with his signature mustache) joins William on a raid to Brittany. On the way back, Harold rescues two soldiers from drowning in the tidal flats around Mont Saint Michel. The story begins with Harold asking the aging King Edward of England if he can rescue some of his captured family members in Normandy. 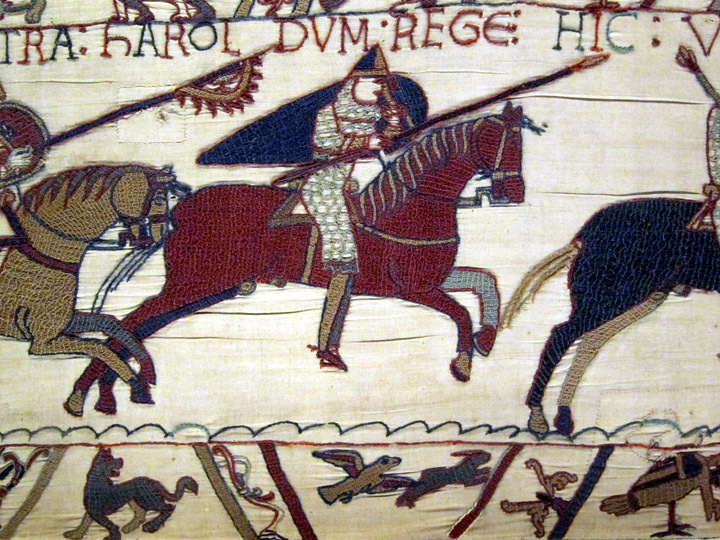 After some merrymaking, Harold sets off and is promptly captured by Count Guy who realizes that the heir to the English throne should be forwarded to William, Duke of Normandy. After some royal bonding and heroism from Harold, he is forced to swear an allegiance to William before being allowed to return to England. Norman squires loading suits of amour bound for England. Now back in England, we see Edward chastising Harold for this oath but he then promptly dies. Harold becomes King followed by a sighting of Halley’s comet which is taken to be a very bad omen. News of Harold’s ascension comes to Normandy. Believing that Harold promised him the crown, William begins preparations to invade and claim England. Harold’s Saxon forces on the defensive. Bodies litter the lower border. A massive Norman force crosses the English Channel and makes camp in England. The Norman cavalry attacks but is at first thwarted by Harold’s forces on the high ground. The battle continues until finally Harold is killed dramatically by being shot in the eye. 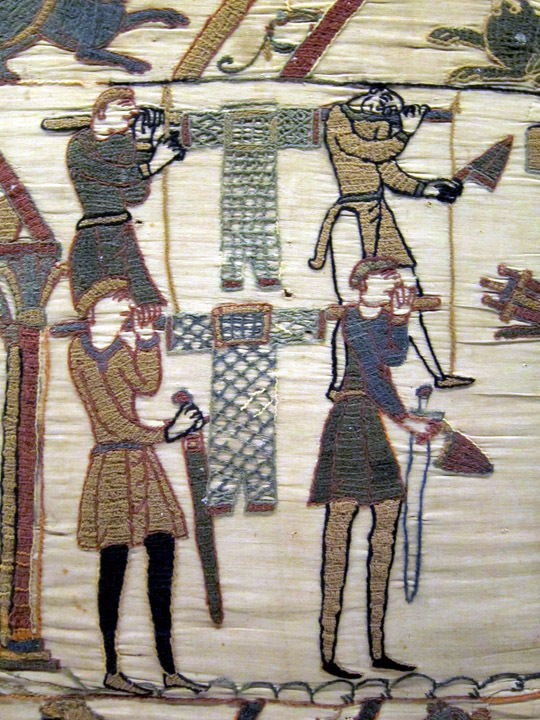 The battle is just wrapping up where the damaged tapestry ends, so we don’t know exactly how the piece described the aftermath and subsequent coronation of William of Normandy. Harold is killed with an arrow to the eye and then is cut down by a knight on horseback. The tapestry consists of a main register with a top and bottom border. The main events are told in little scenes which are only sparsely narrated with character names and short phrases. The borders are filled with tertiary events from the main scene, mythological beasts, or symbolic references. The Tapestry is meant to be “read” from left to right. 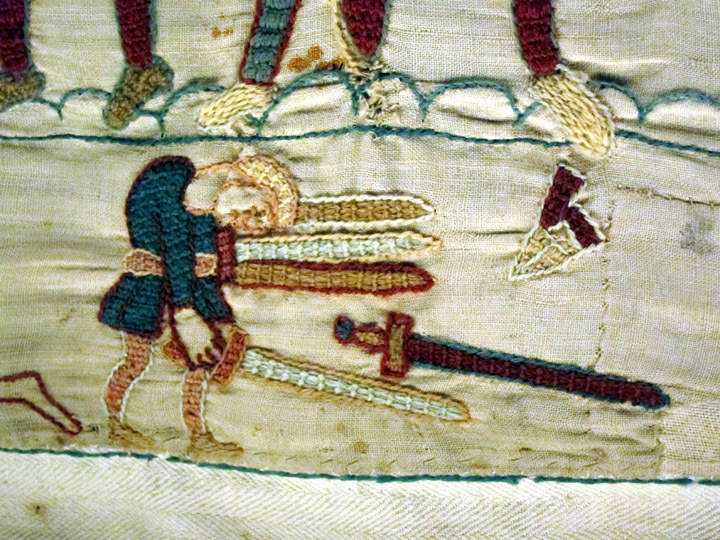 Lower border detail of a peasant collecting swords from the dead soldiers at the Battle of Hastings. The colored wool yarn is still brilliant and vivid. I almost couldn’t believe this piece of linen was 950 years old! A very dense cross-stitch was used to fill in the figures, animals, and settings which are all also elegantly outlined in a contrasting color. While there are thin spots and the occasional stain or hole, the condition of the Tapestry is really excellent. Fantastic griffin detail from the upper border. The Tapestry reads almost like a modern film! There are flashbacks – we see King Edward speaking with family on his deathbed after his funeral scene. Foreshadowing the later invasion, ghost ships can be seen in the lower border of the Halley’s comet scene. The Tapestry also cuts back and forth between Normandy and England advancing the plot, building tension, and preparing the viewer for the climatic showdown. William watches as Harold reluctantly takes an oath. 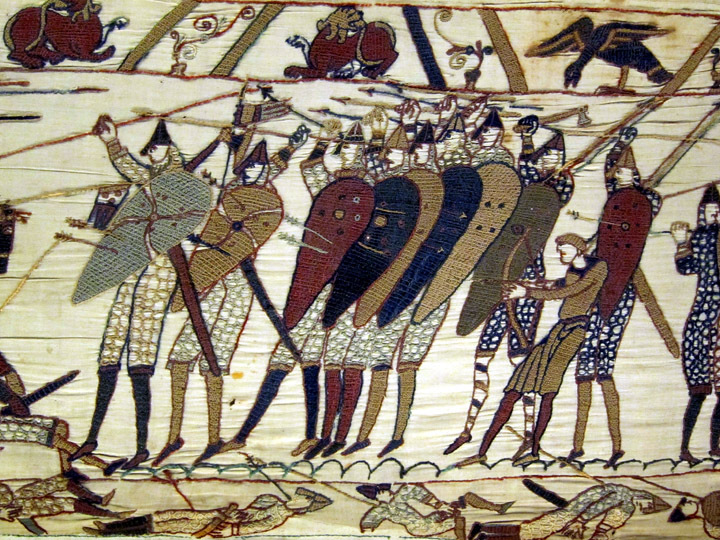 For me, the beauty of the Tapestry is how well it tells the dramatic story of the Norman invasion in single image scenes. From these almost cartoonish pictures, we get character development, intrigue, and a compelling human story. 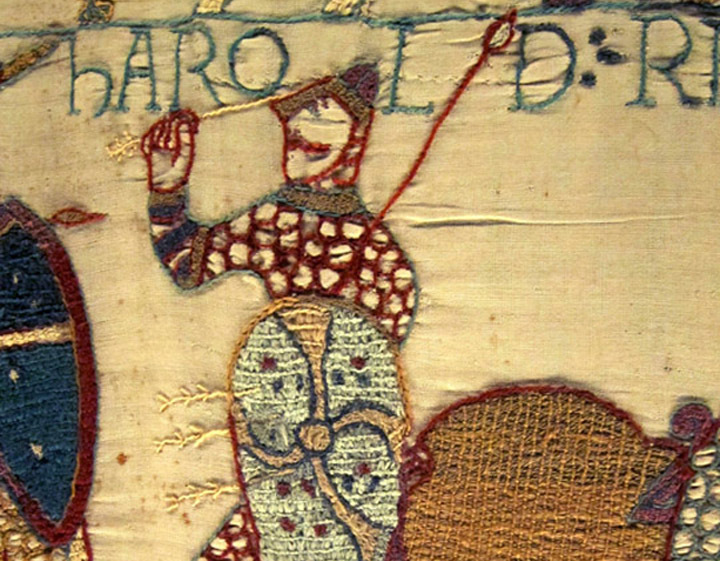 The historical justification for the Norman invasion (or at least William’s rationale for it) was Harold’s supposed pledge of loyalty to the Duke of Normandy. But in the pledge scene on the tapestry, I can’t help but think there was coercion. William sits regally with his sword drawn menacingly. Harold (still a prisoner) appears uncomfortable touching the relics, perhaps squirming, and only reaches a few fingers toward the box on the left. 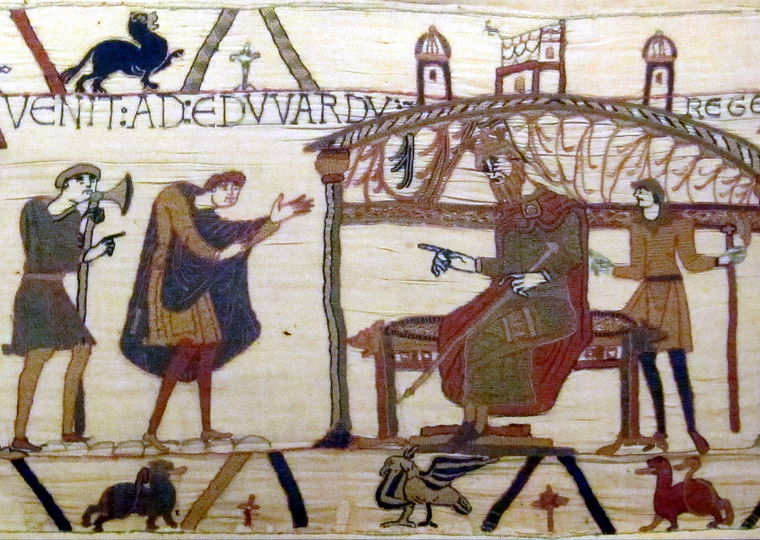 While the text read, “Here Harold has come to Bayeux where Harold took the oath to Duke William”, the image shows a far more complex and suspenseful moment. It is pretty easy to understand Harold’s emotional state upon returning to England and appearing before an angry King Edward. I also love the scene of Harold returning to England. Shoulders slumped and head bent extremely down, he appears to be pleading with Edward. The King looks like he is lecturing and chastising Harold rather than welcoming him back. Harold was in Normandy for at least a year and may have disobeyed all the advice Edward gave him for avoiding trouble in this hostile region. I imagine the old King knows that Harold has been tricked into giving away the Kingdom and is furious about the fate of this people. This image of a hunter about to kill a chained wild beast appears under the scene of William’s messengers racing to retrieve Harold from Guy. An allusion to Harold’s situation, he is defenseless in Normandy and is prey to these foreign powers. 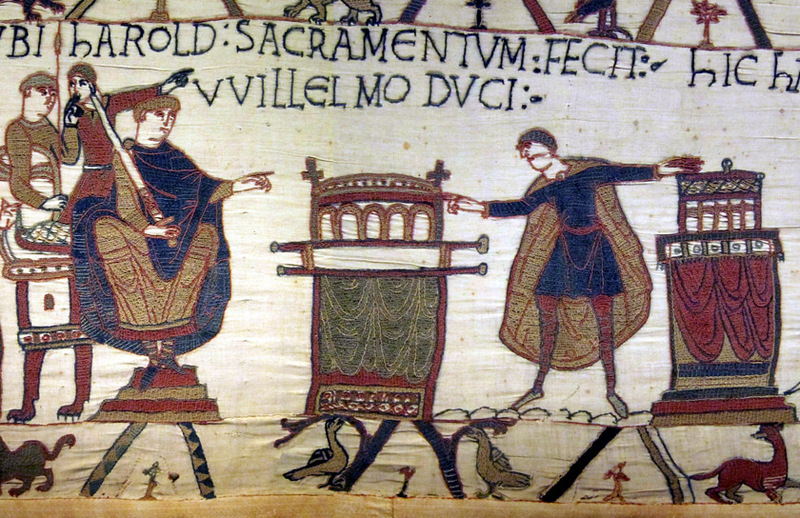 Some of the subtle details suggest that the Bayeux Tapestry is subversively pro-England and shows how Harold was tricked by William. The Normans based their entire claim to England on Harold’s oath to William. If this piece of art was created in France, we would expect the oath to be an exuberant moment and a chance to glorify William. However, we’ve already seen how the image of the oath doesn’t follow the Norman storyline and how Edward appears upset by Harold’s unwitting mistake in France. Small border images reiterate Harold’s weakness and vulnerability while in William’s court. The climatic moment in the fable of the Fox and Crow in which the bird drops the food. There are repeated references to the fable of the Fox and Crow. The crow has a tasty bit of food and the fox uses flattery to get the crow to sing, thus making him drop the food to the fox. In the context of the main story, the tapestry’s designer is showing that William tricked Harold into trusting him through some minor local victories and is then able to extract an illegal oath. 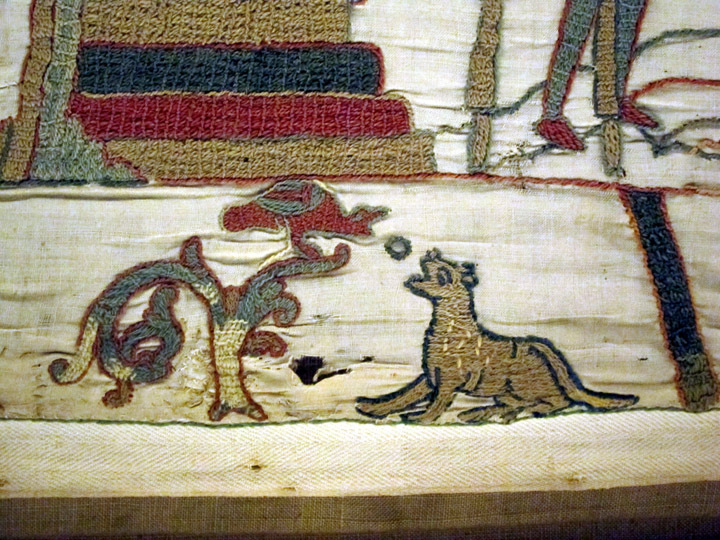 With an understanding of the basic storyline, these little clues pop out throughout the Bayeux Tapestry. The Bayeux Tapestry Museum is located in downtown Bayeux. Visitors receive an audio tour that explains the main events in each scene. The guide can be (and should be) paused to allow enough time to look at each image. I lingered with and returned to just about every scene. I loved the craftsmanship, the powerful narrative, and the little surprises that one finds throughout the piece. I also discovered that you can re-enter the Museum during the same day. So if like me, you realize after 3 hours of just looking at the Bayeux Tapestry that you missed lunch, you can go eat and then come back for more! The Bayeux Tapestry is an immersive masterpiece. On the most basic level, you have to be impressed that such a fragile thing has survived so long. But as you dive into the story, there is a great deal of complexity to the images. The compelling characters and plot draw you in until you are there in the 11th century watching the bloody battle develop and unfold. 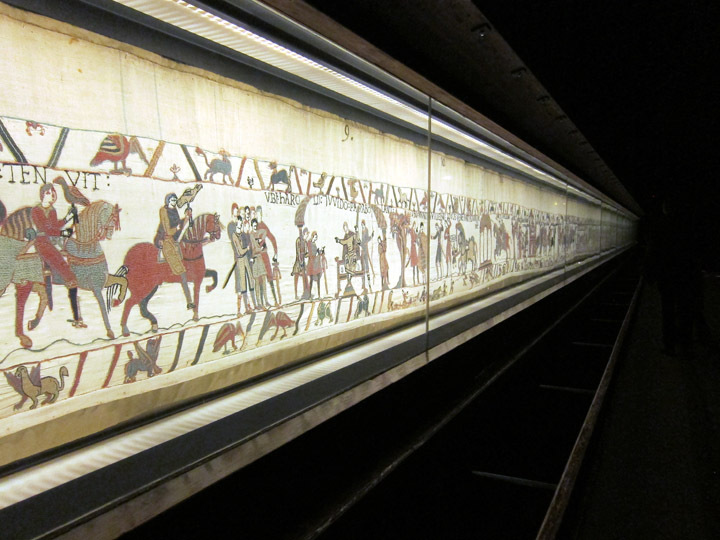 The Bayeux Tapestry goes far beyond art and is historical storytelling at its best. Thank you so much for posting these closeup photos, Christina. Love your lively commentary, too. I’ve wanted to make this art-history-essential pilgrimage since studying the tapestry at school. Now I feel as though I’ve had a private tour! I’m happy to be your tour guide! 🙂 The Tapestry really is fantastic in person – definitely worth the pilgrimage! What an extraordinary tale of history you tell my friend! I briefly, very briefly wrote about the tapestry for a piece I did on Normandy and oh how I wish I could have had this resource available to me!! Well done my friend, very well done! Thanks so much Jeff! 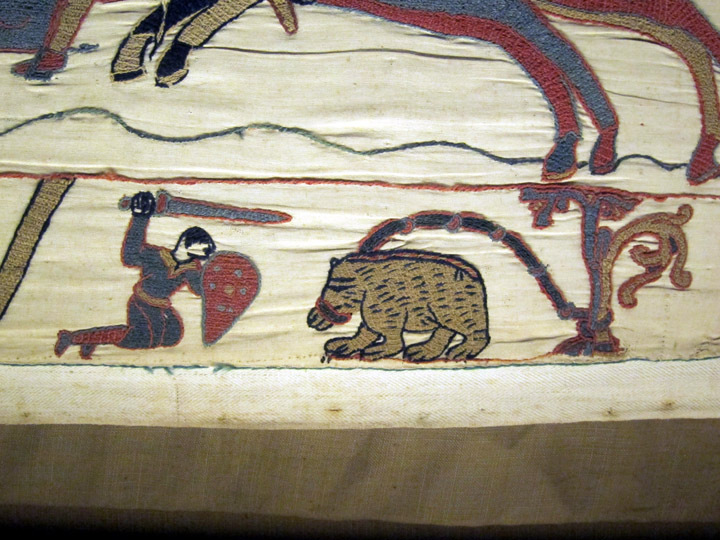 The Tapestry was one of the things I was most looking forward to in Normandy so I did some reading on it before I left. Your post is such a great overview of a wonderful region! Thanks for the link! Medieval tapestries absorb not only dust. They are great absorbing one’s attention when they are so clearly and entertainingly explained. Well done! Thank you! The details of the tapestry were engrossing. One can get easily lost following the main characters on their adventures or enjoying the fantastic creatures ans playful details. You believe everything allowed! It is best to preserve it without taking pictures even without flash, especially when it’s written in the rules of the museum. Taking pictures of the Bayeux Tapestry with a flash is definitely forbidden. With a long exposure time, my camera got some great pictures. So interesting! I haven’t seen this in real life, but I can imagine that it would be a real experience. The condition is amazing!